Made of anodized aluminum, the wheelchair is lightweight, strong and extremely stable. It comes in three sizes that can be adjusted in width, height and length. Safety straps across the front ensure a superior fit to the dog. During use, an X-shaped harness at the rear comfortably supports the dog. 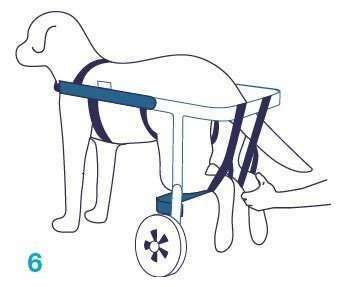 In addition, the harness allows the dog to defecate and urinate without soiling the wheelchair (e.g. : cases of incontinence). Balto Off-Road also comes with dual velour loops for the hind legs, designed to limit stress and relax the dog during walks. The wheelchair is engineered to allow the dog to move on any type of terrain; the rubber wheels ensure excellent stability. 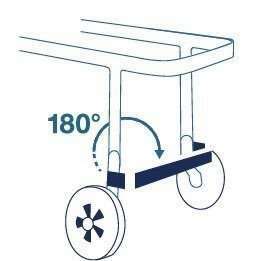 It comes complete with an upper handle that can be attached, if needed; this allows the owner to lift the dog in cases of severe motor difficulty or to help the dog move over an obstacle, such as going up or down steps or getting on and off a curb. All the safety straps are covered in soft, breathable Balto material and are hand-washable. Safety straps are soft, breathable and hand-washable. Adjusting the rods. First, slide the aluminum rods apart until the measured dimensions are reached. 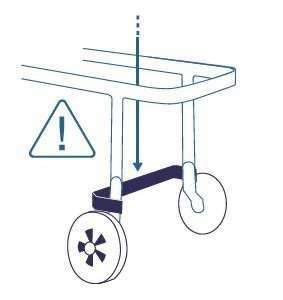 To adjust the wheelchair’s rods in height, length and width, you must remove the screws and the self-locking nuts using a Phillipshead screwdriver and pliers. 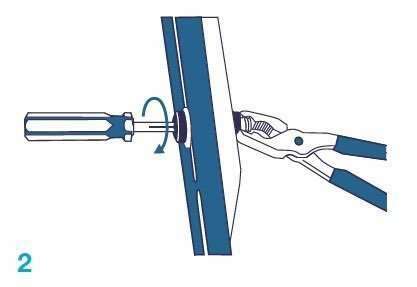 Once adjusted, you need to fully tighten all the screws and self-locking nuts to ensure that the movements caused by use do not cause the screws to loosen over time, resulting in a loss of rigidity and stability. Adjust the front body straps. The length of every strap can be adjusted to fit your dog’s size. 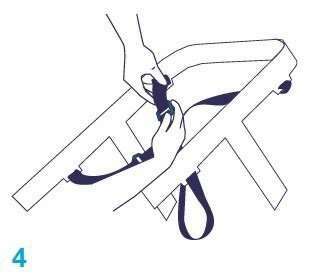 To adjust the ‘X-shaped’ harness, where the dog’s hind legs are inserted, you need to remove the velcro padding and loosen or tighten the straps using the plastic double ring closure. 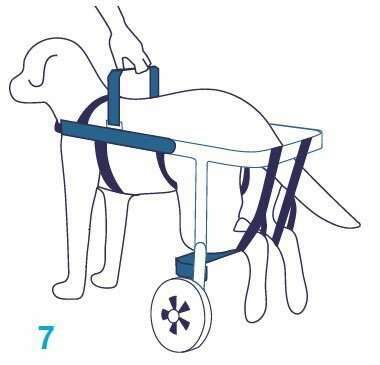 Place the dog inside the wheelchair, closing the upper strap and then adjusting the straps around the front of the chest and under the rib cage (behind the front legs). 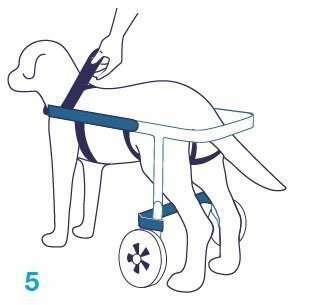 When the wheelchair is in use, it is possible to place the dog’s hind legs through the two velour loops to limit stress on the joints caused by movement. Balto Off-Road comes with a handle for carrying or lifting your dog, useful in cases that are more severe due to near or total loss of mobility. All the screws have self-locking nuts; once the owner has adjusted the wheelchair, the screws must be tightened all the way. 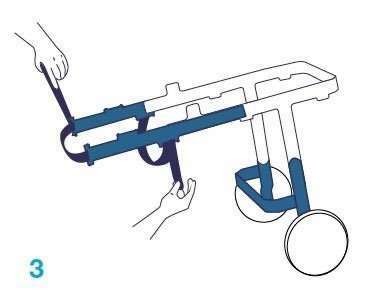 NB: the adjustable connector rod between the wheels must always be screwed into the lowest position on the wheelchair, especially if it is used by very heavy dogs (more than 35 kg). NB: The adjustable rod can be rotated 180 degrees to allow the dog to use the hind legs to walk, for example during rehabilitation. After carefully calculating A, B and C and weighing the dog, refer to the chart.